Things have been real low key around here at the Ballet Magnificat Studios. The recital for the trainees and for the school of the arts students is in two weeks and everybody is looking forward to the summer break that will follow. Tour season for the company has come to a close, and for the next couple of weeks we will just be taking things easy. We are kept busy here at the studio with ballet classes and rehearsing. Soon we will begin preparations for our big summer dance camp that will be held in July. Our summer dance camp is one of the biggest highlights of the year. We company members are given the delightful opportunity of working first-hand, teaching dance classes and bible studies, mentoring, and worshiping with a myriad of young eager Christian ballet students that join us from all around the world. I can't wait to tell you more about it as the time draws nearer. Prior to July, much time is required for planning, organizing, and preparing for the camp, which is the phase that we are about to enter into. Tour season is the best, and I love the summer dance camp itself as well, but the lull of time between the two, at the studio before the dance camp starts- taking ballet classes, rehearsing, and all the preparing can be a challenging stretch if you ask me. It is a period of time loaded with responsibilities and things that need to get done, such as planning the ballet classes and bible study lesson plans for the students. Often times some of the staff's dance camp administrative tasks spills onto our plates as well. As a professional dancer, every day we take class and we rehearse, even if we don't necessarily have a show coming up. Except for the fact that I am now getting paid which I sometimes forget, my life from when I was a student four years ago until now, has not changed very much. But the profession of a performing artist is very distinct from most other professions. We do not have a degree to qualify us for our work, but instead, we have to constantly be maintaining and perfecting our craft. The discipline of keeping our bodies in shape by taking our daily dance classes and the remembering of choreography by reviewing and rehearsing, are essential ingredients in producing quality results and meeting the high standard of excellency in the arts that exists today. I suppose it is somewhat similar to the life of those professional basketball players I saw playing earlier in the year, who have to keep their skills sharp by frequently executing their drills and practicing their shots. I love my job and I know that is a privilege, but Sometimes I question, how does it ever make sense that I am getting paid to be spending all this time in the studio, doing the same thing I've been doing since I was young; our service is when we are on stage performing?! But similar to basketball players who invest much time in practicing on the court prior to entering the big stadiums, I remind myself that there is a TON of behind-the-scenes and off-the-stage work done by dancers that no one ever sees, that goes into putting on a high-quality production that is worth paying for. I don't work hard every day solely for the paycheck, or the accolades, but I cherish that when on tour, my job makes opportunity for great people interaction and ministry. But honestly, In this season being back at home, with the dance camp looming and so much I need to get done outside the studio, the last thing I want to be doing is working hard taking ballet class. With no performance, touring, or gratifying experience in sight, it is hard to remember the reason why we are spending so much monotonous time doing what we do in the studio...though I know it is what is needed in the end. Usually during the touring season with so many 'days off' due to road time and traveling, when we take ballet class it is more so for the purpose of staying in shape. When we are back at home for a long stretch of time like now, we can actually make more progress in improving our technique and perfecting our craft. But it is during these times that I feel like a student again. It is a weird sensation, not bad, it's just that ballet is HARD. My mom always reminds me that you are never to old to learn and discover new things and when it comes to mastering ballet, the sky's the limit! You can never be too turned out, too flexible, too graceful or too strong. Ballet takes hard work, drive, dedication, determination, discipline, perseverance, patience, hope, humility, as many other things in life do. By and large, one can attempt to cultivate these things in ones own strength, but in this blog entry I would like to disclose to you that there is NO WAY I could have amounted to the dancer that I am today with out my faith, without my God helping me along in those things. Satan is too crafty in trying to discourage us, trip us up, kill, steal, and destroy us. The following Scriptures are some of my most favorite truths, promises, and admonitions from the bible that I like to hold on to and memorize in strenuous times. They pertain to the battle we sometimes have in our mind and spirit and the unseen struggle that sometimes occurs in our thought life. 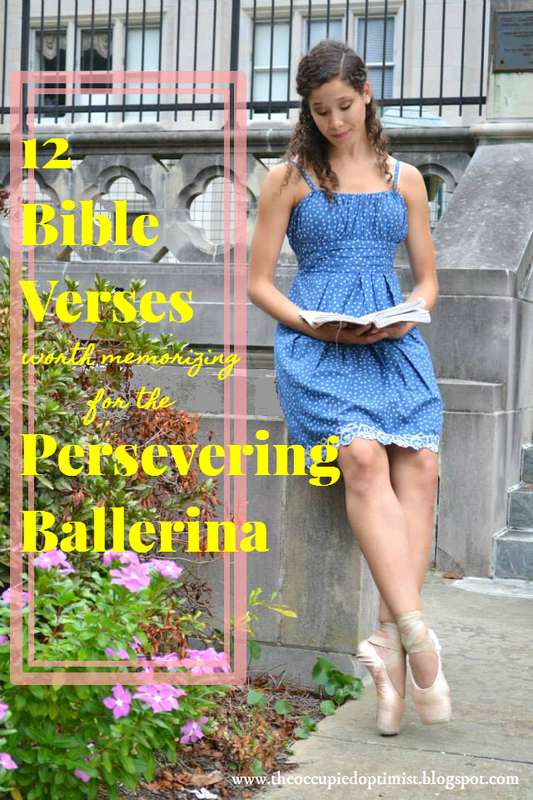 Whether or not you are a ballerina like me, I am sure there is something below for you to take away so check it out! Ephesians 6:12 "For our struggle is not against flesh and blood, but against the rulers, against the authorities, against the powers of this dark world and against the spiritual forces of evil in the heavenly realms." Philippians 4:8 "Whatever is true, whatever is noble, whatever is right, whatever is pure, whatever is lovely, whatever is admirable—if anything is excellent or praiseworthy—think about such things." 2 Corinthians 10:5 "We demolish arguments and every pretension that sets itself up against the knowledge of God, and we take captive every thought to make it obedient to Christ." 2 Timothy 2:3-4 "Join with me in suffering, like a good soldier of Christ Jesus. No one serving as a soldier gets entangled in civilian affairs, but rather tries to please his commanding officer." Matthew 5:6 "Blessed are those who hunger and thirst for righteousness for they will be filled." 1Thessalonians 5:16-18 "Rejoice always, pray continually, give thanks in all circumstances; for this is God’s will for you in Christ Jesus." Genesis 1:27 "So God created mankind in his own image, in the image of God he created them;"
Hebrews 10:19-23 "Therefore, brothers and sisters, since we have confidence to enter the Most Holy Place by the blood of Jesus by a new and living way opened for us through the curtain, that is, his body, and since we have a great priest over the house of God, let us draw near to God with a sincere heart and with the full assurance that faith brings, having our hearts sprinkled to cleanse us from a guilty conscience and having our bodies washed with pure water. Let us hold unswervingly to the hope we profess, for he who promised is faithful." Psalm 84:10 "Better is one day in your courts than a thousand elsewhere; I would rather be a doorkeeper in the house of my God than dwell in the tents of the wicked." Matthew 3:8 "Produce fruit in keeping with repentance." What is one of your favorite scriptures?